It’s finally happening. 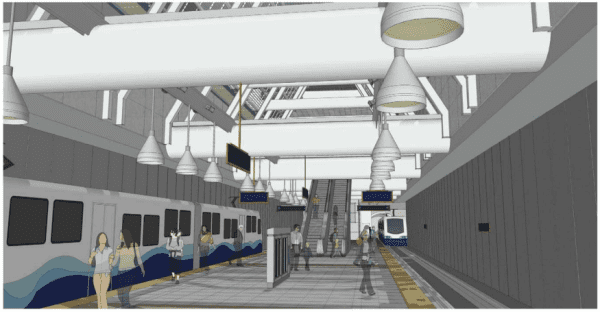 Sound Transit work crews are expected to break ground on the new Capitol Hill Station as early as Thursday. The first part of the station to be built will actually be the west entrance and walkway under Broadway that will connect the entrance to the main station. Currently the west entrance space, just south of Denny, is being used as a parking lot for Sound Transit work vehicles. Intermittent noise to drill and secure the pilings. Limited truck traffic to and from the site to deliver materials. The sidewalk in front of the site and traffic lanes on Broadway will remain open. The $1.9 billion, 3.1 mile, U-Link light rail extension connecting downtown to UW’s southeastern edge via Capitol Hill Station is slated to start running in 2016. In September CHS reported that the project to bore twin tunnels and complete stations at Montlake and on Broadway was six months ahead of schedule and $100 million below budget. This entry was posted in News, etc. and tagged light rail, sound transit, transit by Bryan Cohen. Bookmark the permalink.